Ever caught up in a situation where you needed instant money for paying a medical bill or ever wanted to buy a new gadget but found yourself short on the savings? To serve such situation many lenders have come up in the market with quick loan app. The entire process of the loan is done online. These applications provide instant loan with minimum paperwork. People take personal loans for various reasons like to cover their home repair expenses, to buy a new car or phone, for a vacation, for festival shopping, balance transfer and so on. You can take a personal loan for any requirement. These apps are also called as personal loan app. The unique feature of these apps is the short and speedy process. You don’t have to visit any branch or submit documents physically. 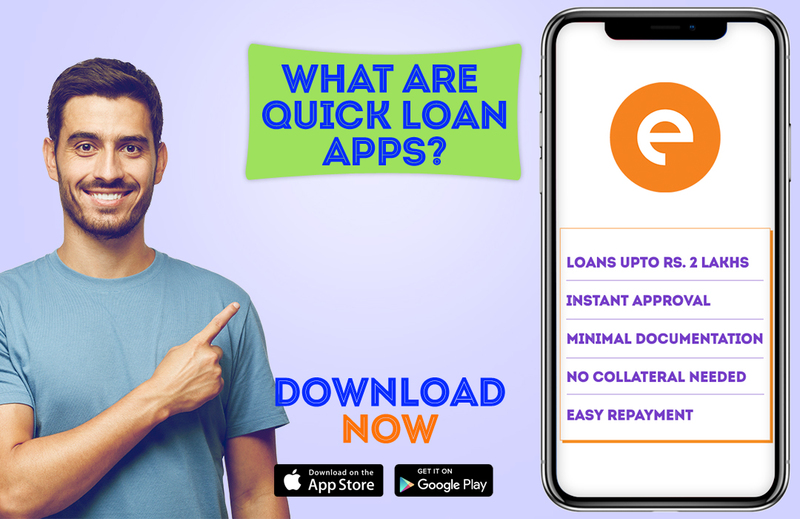 You can check the loan eligibility via the quick loan app. The whole process takes just 15 to 20 minutes. You can download the app from your Google play store or Apple app store. Almost everyone is eligible to take a money loan. • Once you download the app on your smartphone, register yourself by entering your basic details like name, number, address, and bank details. • The next step is to enter the loan information i.e. : loan amount and the duration. You can take a loan starting from ₹10,000 to ₹1 or 2 lakhs. The duration can be 15, 30 or 90 days. • You have to submit your documents online to the personal loan app. • Once you upload all the details and documents, the app will then review your request. • When your request is approved, the money loan is then transferred to your personal savings account. The documents required by quick loan app are quite simple. You need to submit your identity, address and income proof documents. For identity proof, you can submit passport or Aadhar card or pan card or driver’s license. As address proof, you can submit a passport or rental agreement or utility bills. Your bank statements and salary slips for 3 to 6 months will be required to avail a money loan. You can take a money loan from any personal loan app if your age is between 23 years to 58 years old. You have to be a resident of India and a salaried employee of a registered company. If you own a business, your business needs to be in existence for a period of 3 years. You can submit your ownership documents, business utility bills and business profit and loss statement. You can repay the personal loan app via bank transfer or by depositing a cheque. The app will send you alerts before your due date.